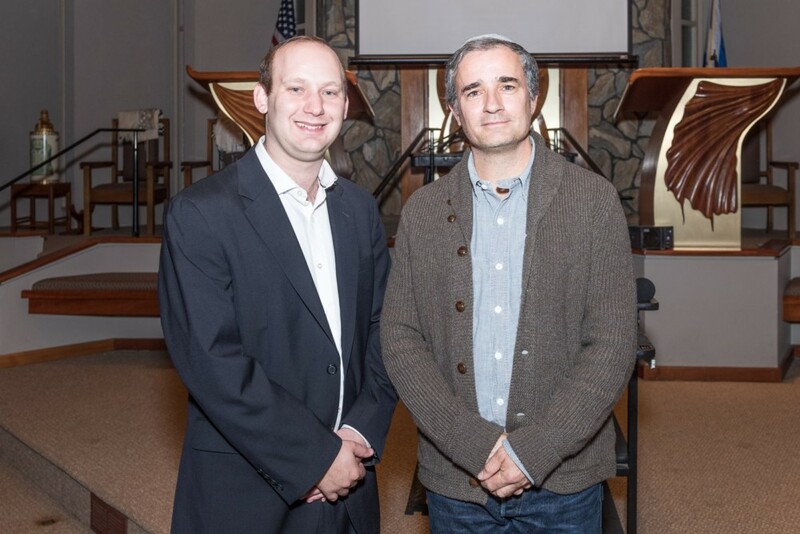 Above: Brendan Murphy (right) and Etz Chaim’s Rabbi Daniel Dorsch. It’s an age old question, what is the source of anti-Semitism and “Why the Jews”? Why did the Holocaust happen? 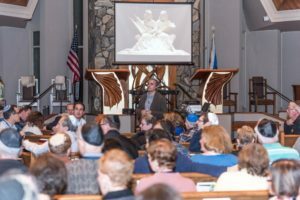 As Jews we discuss and learn about these questions from an early age, but what about the non-Jewish community? 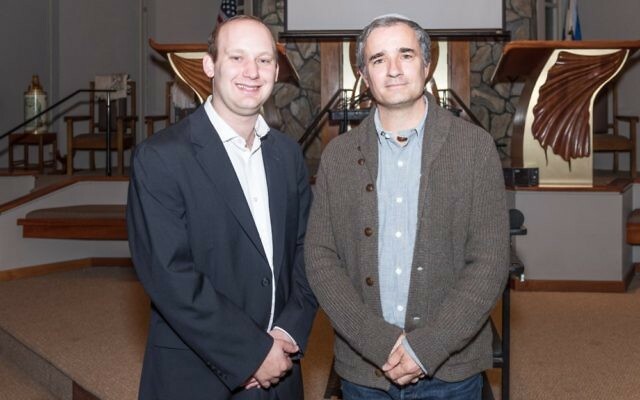 On Nov. 15, more than 250 people gathered at Congregation Etz Chaim in East Cobb as part of the Lilmode-Adult Education in partnership with The Catholic Church of St Ann presented Mr. Brendan Murphy of the Marist School in Atlanta to discuss and teach about these very questions from a Christian perspective. Mr. Murphy is the 2016 Georgia State Commissions Distinguished educator on the Holocaust. In 1996, Mr. Murphy developed a World History and Holocaust seminar “Bearing Witness” which includes a trip to the US Holocaust Museum and a class trip to Europe to visit significant Holocaust sites such as Auschwitz and Dachau. Murphy also conducts evening classes for parents and the community as part of the Marist Evening Series. During his lecture, Mr. Murphy took us on a journey through history to explain the origins of Jewish hatred, blood libels and the myths of deicide and supercessionism. The replacement of the old covenant with the new as taught by the Church, the origins of Christianity and the formation of the first ghetto in Venice. Throughout history and especially during the Medieval period on churches throughout Europe, architecture and statuary was used as a teaching tool. Or as Mr. Murphy describes it, a Medieval power point presentation. Supercessionism was illustrated by the double statues of Ecclesia and Synagoga. Ecclesia represented the Church and was crowned and stood upright. Synagoga was looking down and blindfolded with her crown on the ground. These descriptions may sound bigoted to us today but they should be examined in the context of history. While many countries over the centuries have expelled their Jewish populations, none was so determined to exterminate them than Hitler and the Nazis. Murphy brought us back to the time of the Holocaust with a better understanding of the origins of how this could have happened, in addition to the pure hatred and racism of Hitler himself. Many in the audience both Jewish and Catholic had never heard much of this history. Ending the evenings lecture on a very positive note, Mr. Murphy described the visit by Pope Francis to the United States last year. A Catholic school in Philadelphia was informed that the Pope would be visiting them and to commemorate such a special occasion they commissioned a sculpture at the school that would be presented to the Pope. The statue depicted Ecclesia and Synagoga but with a decidedly modern twist. Both were seated, dressed alike, in fact twins, one holding a Torah and the other a Bible. Each statue looking at what the other is holding. Friendship and Dialogue. The name of the sculpture is Ecclesia-Synagoga In Our Time. A very hopeful end to the evening.